Welcome to ModBargain's Brembo Webpage!! 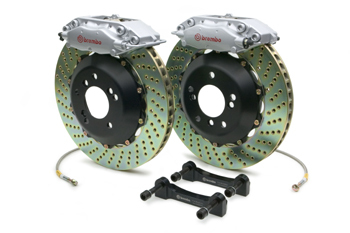 This is our purchase page for Brembo products. If you have not yet seen ModBargain's main Brembo page, please go ahead and do so--it is filled with vital and intriguing information about Brembo's manufacturing, testing and current product lines, as well as a glimpse of Brembo’s history and their dedication to future technology. Within those pages, ModBargains.com, as Brembo's authorized dealers, would like to offer you insight on Brembo’s attention to quality, performance, and SAFETY, and how that is incorporated into every Gran Turismo braking system that we offer. Click here for our Brembo's Main Page!! Many of the GT systems require modification to, or removal of the OEM dust shield or backing plate.